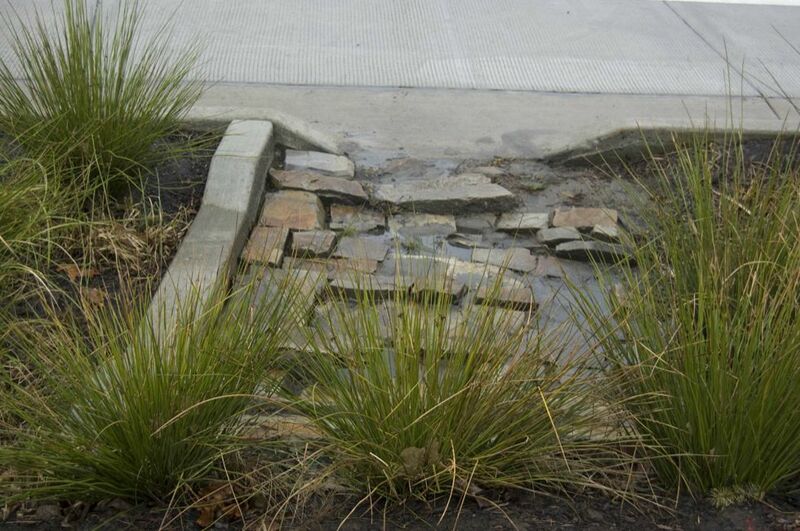 Bioswales are vegetated, shallow, landscaped depressions designed to capture, treat, and infiltrate stormwater runoff as it moves downstream. They are typically sized to treat the water quality event, also known as the “first flush,” which is the first and often most polluted volume of water resulting from a storm event. 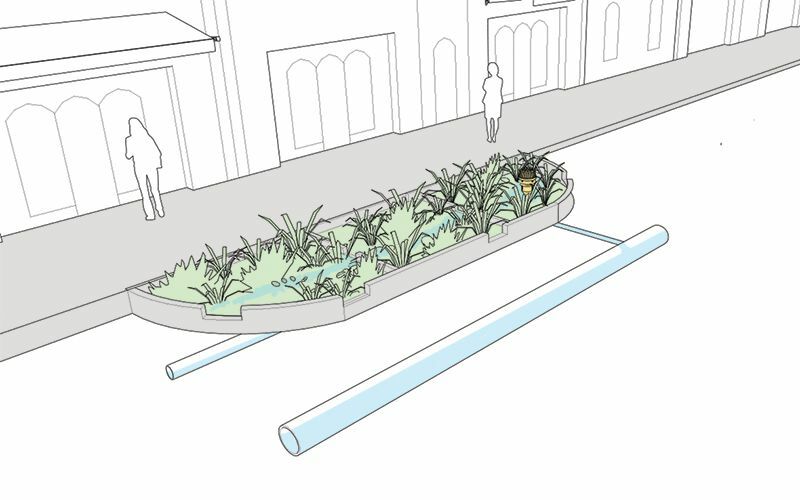 Bioswales are the most effective type of green infrastructure facility in slowing runoff velocity and cleansing water while recharging the underlying groundwater table. 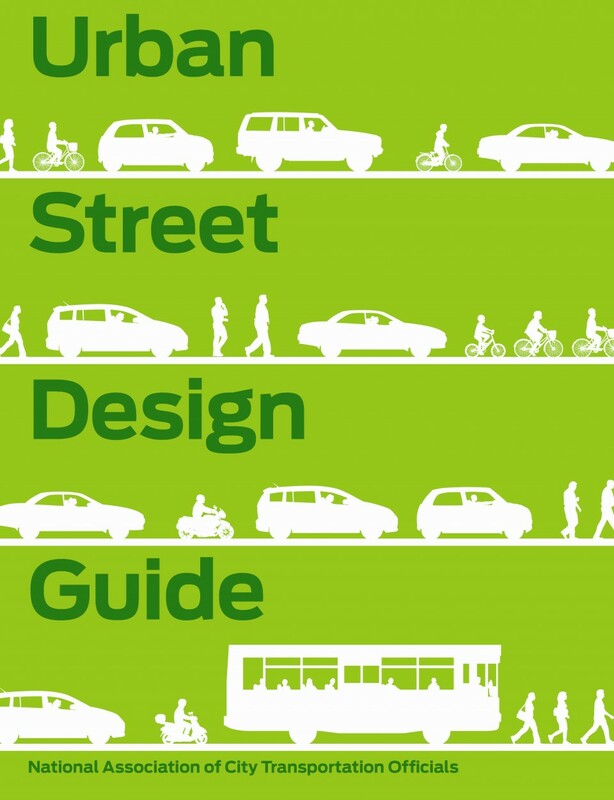 They have flexible siting requirements, allowing them to be integrated with medians, cul­de­sacs, bulb outs, and other public space or traffic calming strategies. 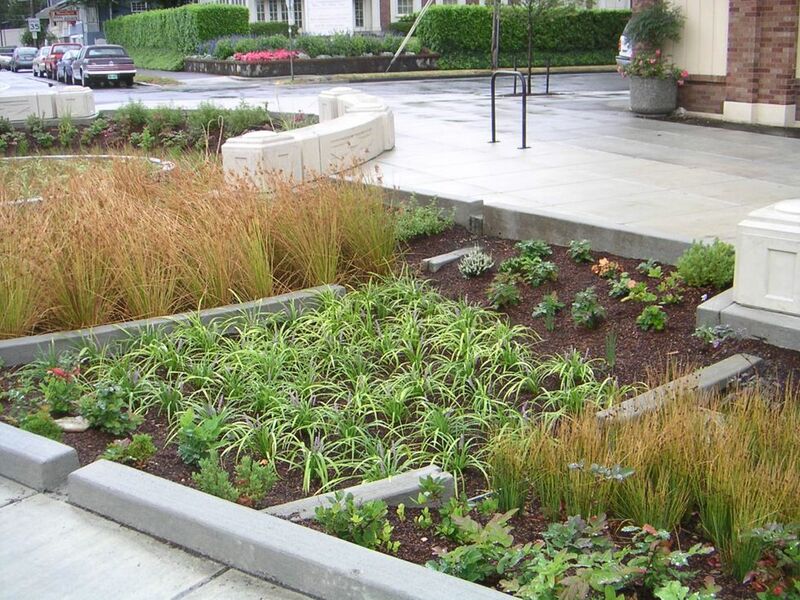 Bioswales are the most effective type of green infrastructure facility in slowing runoff velocity and cleansing water while recharging the underlying groundwater table. 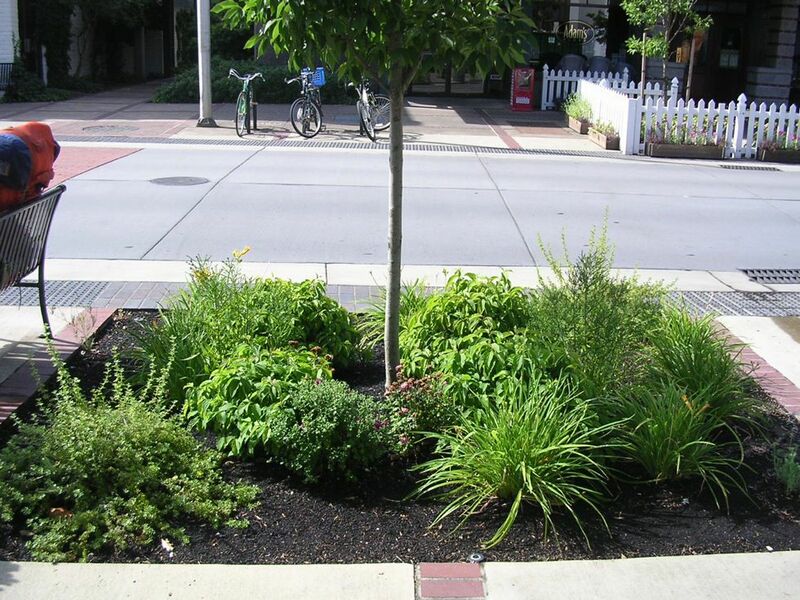 6 Bioswales should be composed of diverse, native vegetation. Vegetation selection should consider species compatibility, minimum irrigation requirements, and the potential for wildlife habitat creation. To reduce exit velocities and prevent erosion, use pretreatment exit energy dissipaters, such as rocks. If the longitudinal slope exceeds 4%, utilize check dams, berms or weirs to create a step-down gradient. Limit the maximum ponding depth to 6–12 inches. 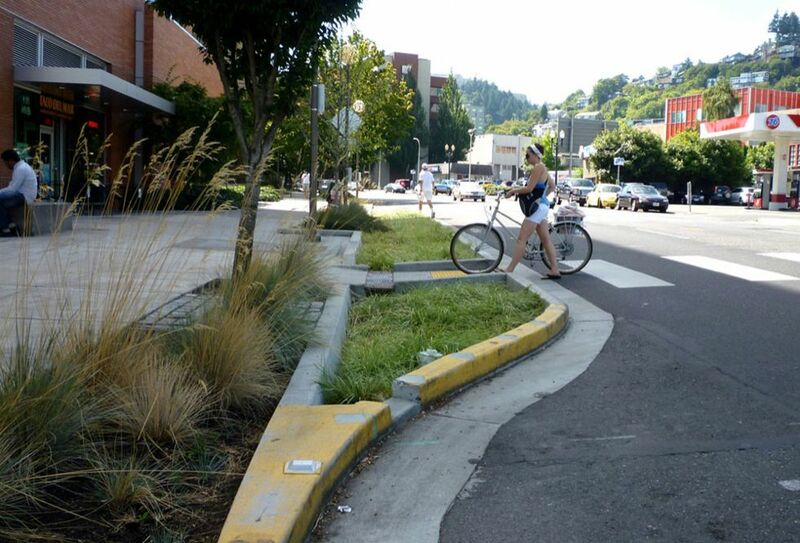 7 Discourage pedestrian trampling by using low curbs or barriers, or hardy vegetative ground covers. 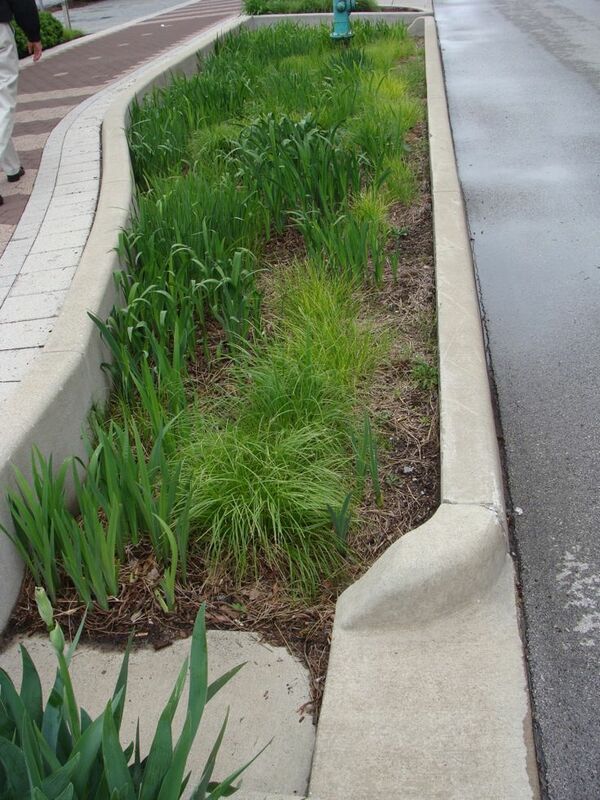 Bioswales are not recommended in locations with low infiltration rates because standing water, localized flooding, and other issues can cause problems within the street and sidewalk in an urban environment. 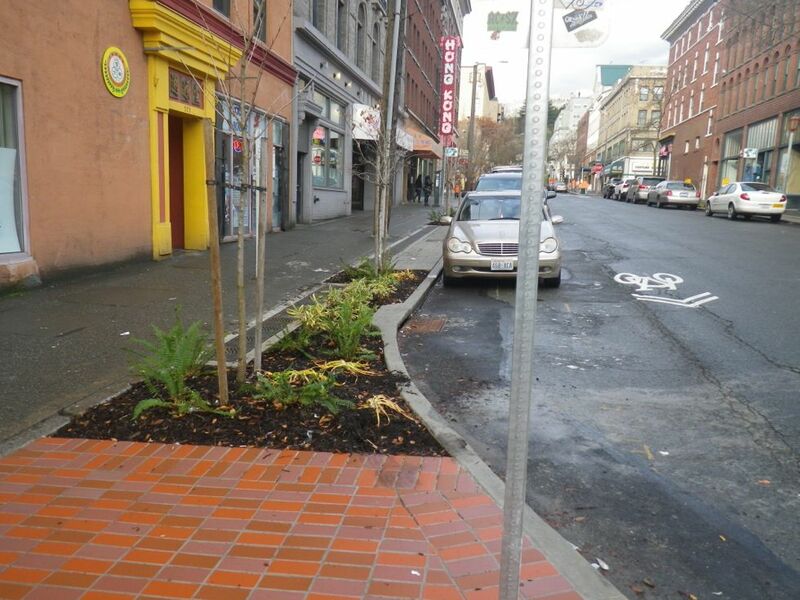 1 Bioswales require appropriate media composition for soil construction. The engineered soil mixture should consist of 5% maximum clay content. Ensure that infiltration rates meet their minimum and maximum criteria. 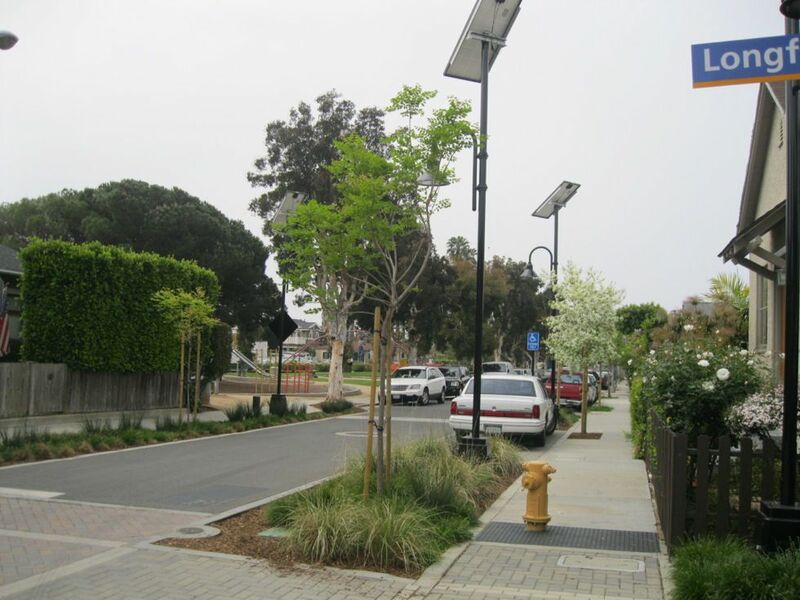 The engineered soil mixture must be designed to pass 5–10 inches of rain water per hour. Verify that underlying native soils are not contaminated prior to implementation. Prior contamination may undermine the purpose of the facility and must be remediated before installation. Infiltration facilities should only be located in class A or B soils. 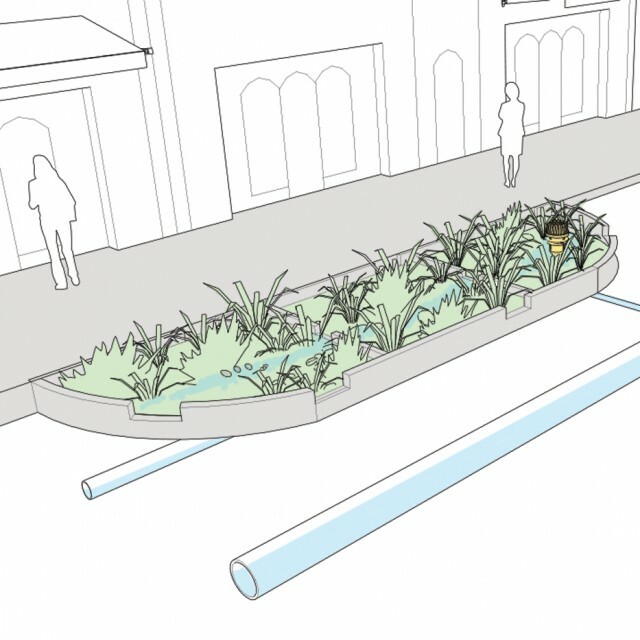 Bioswales have a slight longitudinal slope that moves water along the surface to allow sediments and pollutants to settle out. In-place infiltration then allows localized groundwater recharge. Ideal side slopes are 4:1, with a maximum slope of 3:1. 2 Protect adjacent subsurface infrastructure by maintaining minimum clearances. Install waterproof liners as separation barriers or construct a deep curb to separate the roadbed subgrade or parallel utility line from the facility. 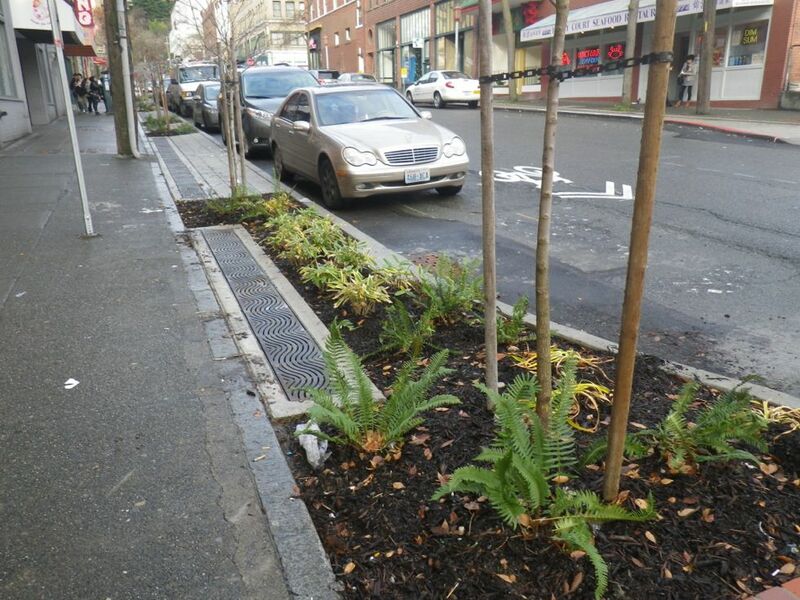 3 Maintain a 5-foot minimum clearance from the bottom of the bioswale to high groundwater table. 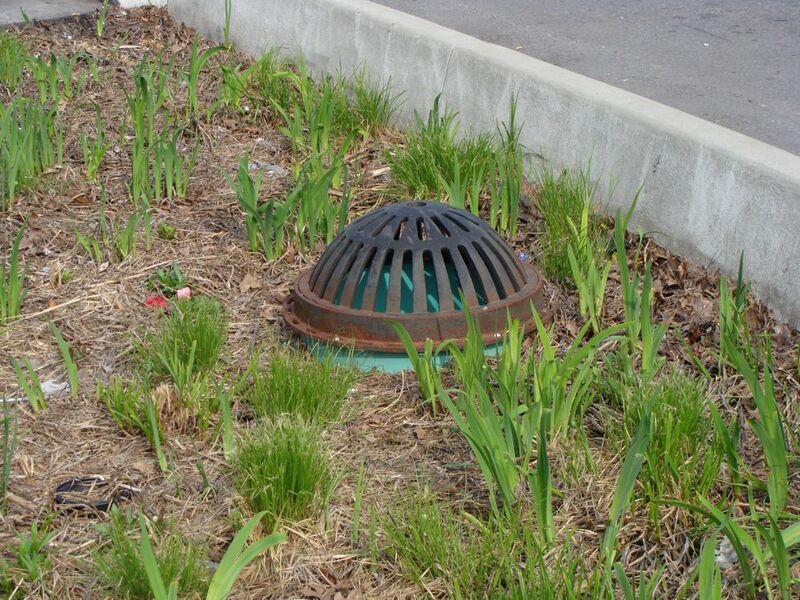 4 Raise the overflow/bypass drain system approximately 6 inches above the soil surface to manage storms larger than the water quality event. 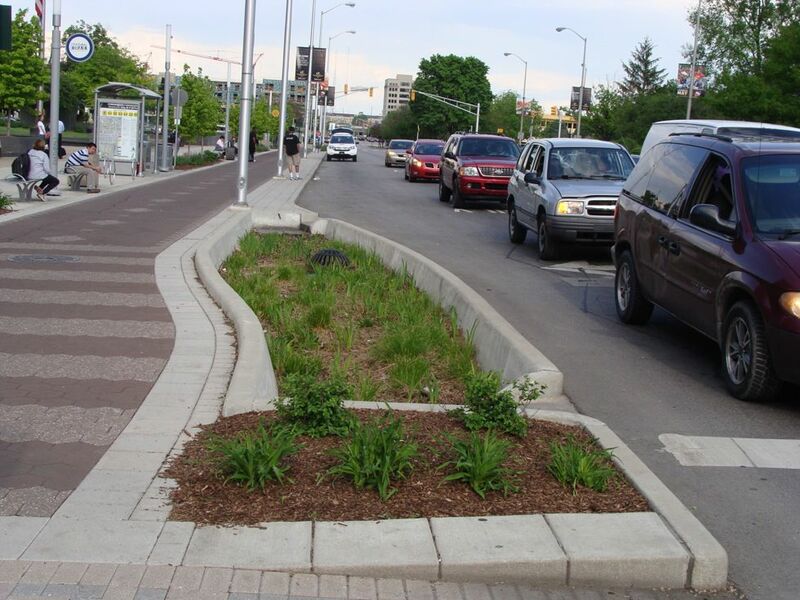 5 Runoff that enters the bioswale in a sheetflow fashion requires that the edge of the bioswale be flush with grade. 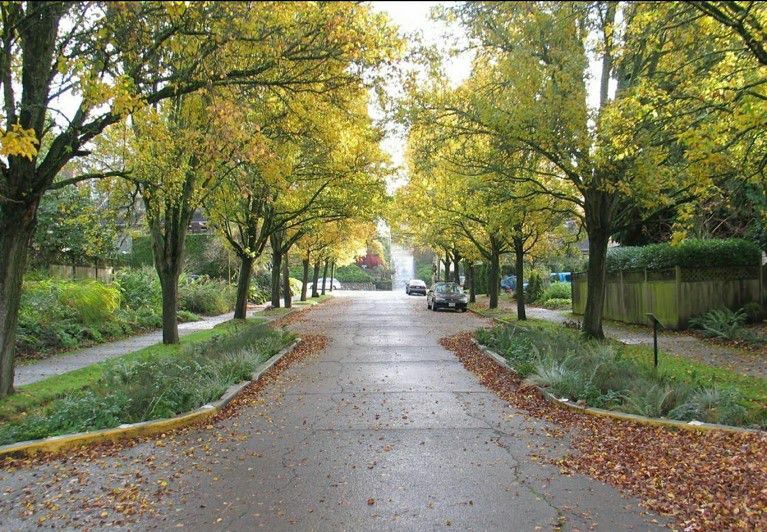 Where curbs are necessary, intermittently space curb cuts to allow runoff to enter and be treated within the swale. 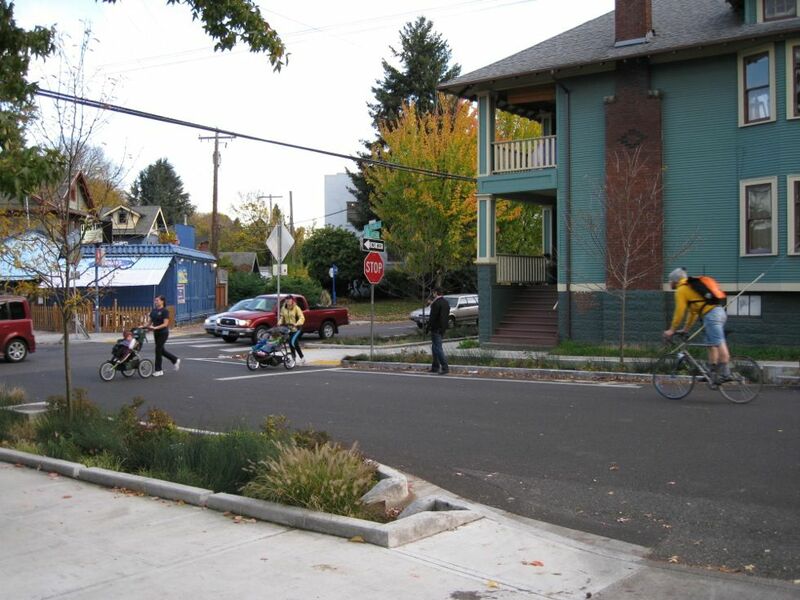 Both sheetflow and curb cut systems must allow for a minimum 2-inch drop in grade between the street grade and the finished grade of the facility. 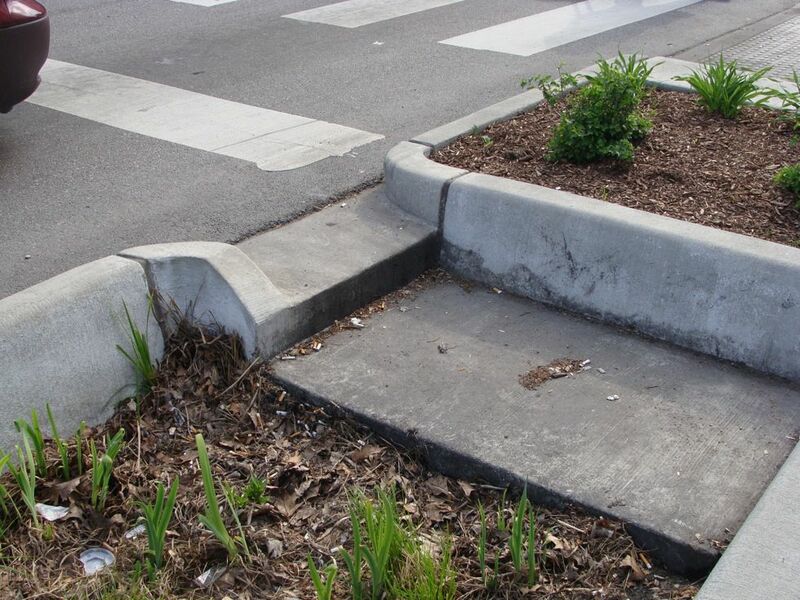 Curb cuts should be at least 18 inches wide and spaced from 3–15 feet apart. Center for Watershed Protection. 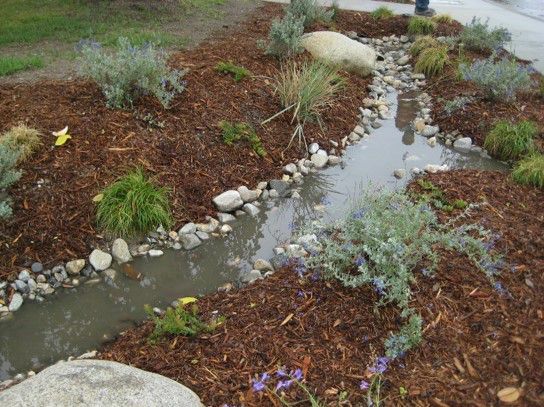 Stormwater Management Guidebook. District of Columbia: 2012. Matsuno, Hiroko, and Selina Chiu. 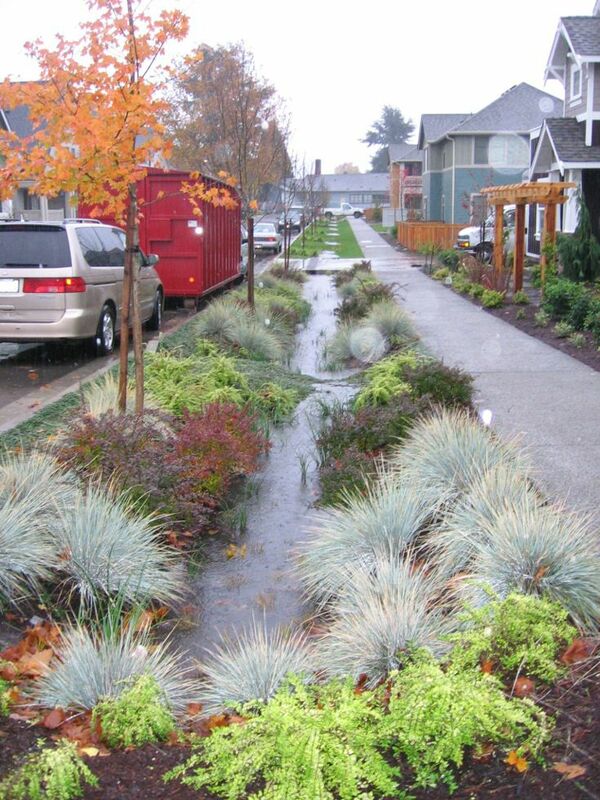 “The Stormwater Management Challenge” Seattle: Design Precedent Studies, University of Washington, 2010. U.S. Environmental Protection Agency. 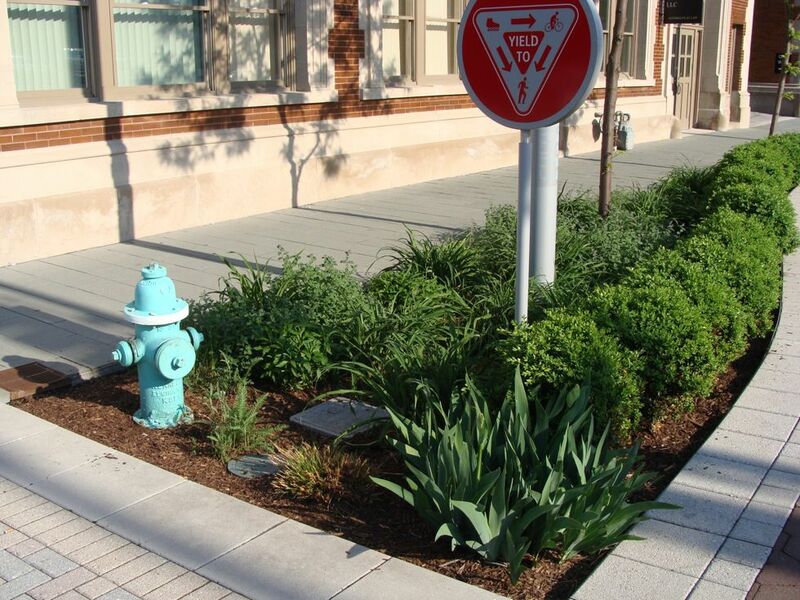 Stormwater Management Handbook Implementing Green Infrastructure in Northern Kentucky Communities. Kentucky: 2009. 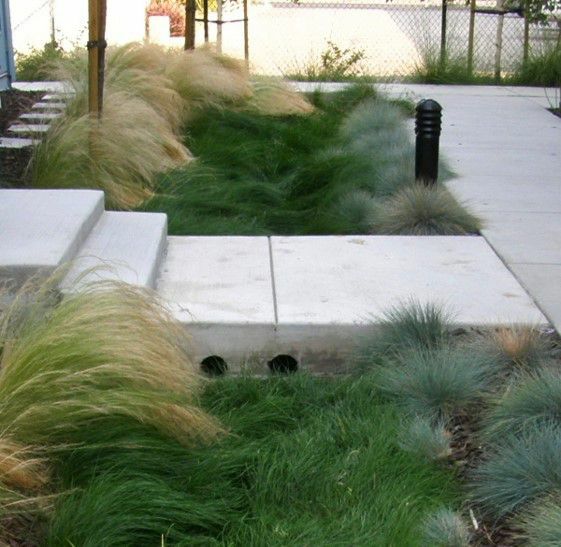 References for Bioswales: 6 found.